Hot wax is poured into the molds — one a sturdy, plastic mother mold and the second, inside that, a silicone mold that is sensitive enough to pick up the contours of the figure’s nose, the parallel lines on his helmet and the pebbly base. 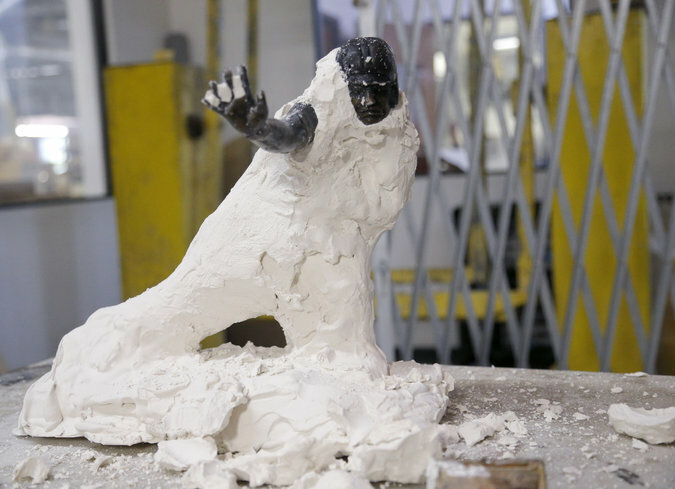 The mold is hardened to make a cast. Flaws in the cast — for instance, seam lines where the molds came together — are removed with a heated metal implement. The wax cast is then dipped in what is known as investment, a kind of liquid ceramic, which hardens and, crucially, is heat resistant. This is then heated, melting the wax, which escapes out a hole in the bottom of one of the player’s feet. The hole is not visible once the trophy is mounted on its base. A Heisman Trophy, fresh from the foundry and still enrobed in its ceramic shell.